A must-have for every classroom, library, and family bookshelf. The wonders of the natural world are set on incredible display in The Animal Book, created by DK and the Smithsonian. Our world is filled with extraordinary diversity, from amoebas to zebras, tiny toadstools to giant oaks. This dynamic guide to life on our planet is packed full of information about creatures big and small. Structured according to scientific classification, and with straightforward explanations of more than 1,500 specimens, this book includes tons of stunning photographs to engage children. A "tree of life" greets readers at the beginning of the book, charting the complex and interconnected relationships between species. Every plant and animal is presented in proportion, with in-depth spreads giving a sense of scale to each organism. Feature spreads that focus on a single specimen let kids get up close and personal with the world's most fascinating animals. 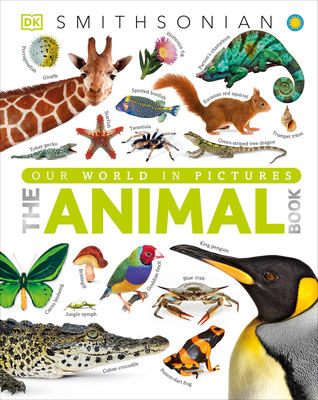 The Animal Book is perfect not only for homework help or school reports, but to satisfy kids' curiosity about the wealth of amazing living creatures that inhabit our planet. David Burnie is a fellow of the Zoological Society of London and has written and contributed to more than 100 books about the natural world. He was consultant editor of DK's highly successful Animal and The Natural History Book. David is also a former winner of the Aventis Prize for Science Books. Trusted by parents, teachers, librarians, and kids across the world, DK is an award-winning publisher of visual reference books for children, including the DK Eyewitness Books, DK findout!, and Maker Lab series. DK books combine clear photography and illustration with expert text to show you what others only tell you.